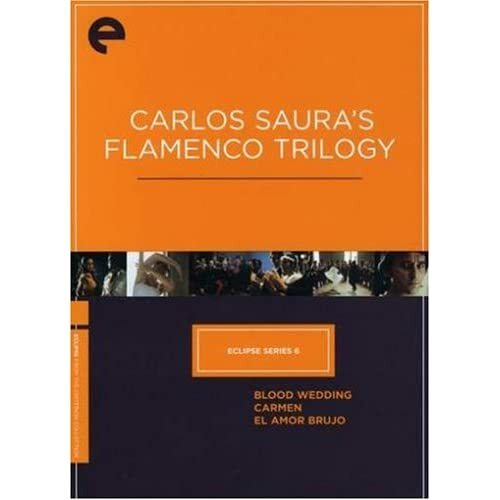 Spanish film director Carlos Saura’s first film venture featuring Latin dance was Bodas de sangre [Blood Wedding]. This film also marked his first of three collaborations with famed flamenco dancer/choreographer Antonio Gades. I highly recommend all three films. Each film combines narrative, dance and refined filmmaking in an effort to explore life, love and death from a Spanish perspective. The duo’s second film Carmen is my favorite of the three. It’s the story of a choreographer staging a ballet adaptation of Bizet’s opera, Carmen. So, it’s back stage drama intermingled with on stage drama and lots of dancing. Gradually the lines of filmmaking, theater and ballet begin to blur as the characters real life narratives start to mimic the staged narrative. By the end of the film you are not quite sure if you’re watching a rehearsal, or something that was supposed to have really happened. The tobacco factory scene alone is worth the effort. It’s an intensely orchestrated all girl knife fight in dance – think Michael Jackson’s Beat It, done flamenco style. With finals starting soon now is an inopportune time for pleasure reading. But after finals during winter break, when your brain feels fried, might I suggest you refresh yourself through the power of modern fantasy novels? First, Neil Gaiman’s Newbury Award winning The Graveyard Book. The book tells the story Nobody Owens, a child growing up in a graveyard raised the ghosts. The book is a superb fantasy tale that involves ghosts, ghouls, witches, President Harry Truman, and an international group of evil men. While the book remains largely episodic in nature, readers will feel right at home in the abnormal, yet familiar world. Next, journey to an England ruled by magicians that harness the power of spirits to maintain their rule over the common folk in Jonathan Stroud’s The Amulet of Samarkand. The story begins with the magician’s apprentice Nathaniel summoning the snarky djinni Bartimaeus. Nathaniel wants to use Bartimaeus to get revenge on the high ranking Simon Lovelace for embarrassing him. The novel splits the narrative duties between Nathaniel and Bartimaeus as they realize the depth of political corruption these magicians are involved in. The novel is exciting and accessible with load of moral ambiguity, political power grabs, and off-beat sarcastic humor. We’ve expanded our fleet of laptops that are available for checkout at the Learning Commons desk! We have something to fit everyone’s style, so check out all the new choices today! And don’t forget all the other choices you have as well. At the Learning Commons desk you can check out headphones, markers, study rooms, reserve materials, firewire cables, digital cameras, video cameras, and more. Remember — we’re more than just books! Neufeld, Josh. A.D. New Orleans After the Deluge. New York: Pantheon Books, 2009. Call Number: F379 .N553 A26 2009. Sometimes pictures are more powerful than words. In the graphic novel A.D.: New Orleans After the Deluge, Neufeld tells the markedly different stories of seven Crescent City residents who survived Hurricane Katrina through vivid drawings and text. Attempting to give a diverse picture of what New Orleanians experienced during the storm and its aftermath, the author follows the stories of people from different socioeconomic and ethnic backgrounds, some of whom evacuated before the storm, and some who stayed – whether for excitement, or because they had no other option. This graphic novel gives the reader a look at some of what the media did not tell us about the storm: the camaraderie among the “refugees” at the superdome and stories of neighbors risking their own lives to save each other. For those who left, we see the painful homesickness they felt for their city after evacuating, and the even bigger devastation of returning to destroyed homes where everything was lost. Within the intensity of the story, Neufeld does an incredible job showing the strength and resilience of the people of New Orleans. Eco, Umberto Baudolino. New York : Harcourt, 2002. Call Number: PQ4865 .C6 B3813 2002 (1 copy). In this piece to fiction that is as mythically epic as any of Eco’s work, the Italian Professor reminds us of the most important lesson of history: The only absolute part of truth is its malleability. Set amidst the sacking of Constantinople (not Istanbul) in the second crusade, the title character recounts his life story, even as the city burns, to a court historian, Niketas. The adoptive son of Fredrick Barbarossa and a self-confessed liar, Baudolino tells a fabulous story about his life-long search for the mythical ruler known only as Prester John. John, who was largely invented by Baudolino, is said to rule over a vast christian nation far to the east full of fantastic creatures and strange phenomena including a river of tumbling stone. Over time, even Baudolino’s companions, who helped conceive of this Prester John, begin to believe in his existence. Playful and accessible, Baudolino presents a world that is simultaneously recognizable and yet somehow skewed, and in doing so points a finger both at belief and our preconceptions of history. Shaun of the dead / Universal Pictures, Studio Canal and Working Title Films present a WT2 production in association with Big Talk Productions produced in association with Inside Track 2, LLP ; produced by Nira Park ; written by Simon Pegg and Edgar Wright ; directed by Edgar Wright. Shaun of the Dead is an apropos watch during the Halloween season. This comedy is a homage to the zombie movie subgenre. In the midst of a zombie outbreak in London, Shaun fights zombies while simultaneously fighting for the heart of his ex-girlfriend. A whiney salesman, Shaun is an unlikely hero. Before proceeding with this review, there is one caveat: I hate horror movies. I am quite squeamish and I have never understood the popular fixation with zombies. Several of my friends recommended this movie to me over the years, but I could not compel myself to watch even a mock horror movie. Two factors contributed to me finally viewing this movie. First, I recently watched the superbly silly British television series Spaced. Created by overlapping visionaries, this show also features several of the actors who later starred in Shaun of the Dead. The Spaced characters are so loveable and quirky that I softened to the idea of a comedic zombie movie starring their actors. Second, I spotted Shaun of the Dead the first time that I perused the Monroe Library DVD collection. In addition to the blood, gore, and the undead munching on corpses, Shaun of the Dead has all of the dysfunctional relationships, moral indifference, and general cluelessness that was so entertaining on Spaced. Shaun of the Dead is worth viewing even if you do not like zombies. May; a Lions Gate Films release ; 2 Loop Films presents a Loopy production ; a film by Lucky McKee ; produced by Marius Balchunas and Scott Sturgeon ; written and directed by Lucky McKee. Just in time for Halloween I give you two unconventional horror flicks for this holiday season. First selection is May, the story of an awkward, shy girl and her sewing machine. May’s only wish in life is to make new friends. When her social skills fall flat, the time comes when she must rely on her crafty talents to make the perfect friend. Stitch-stitch. Next up is Black Sheep, a horror/comedy about the dangers of animal husbandry and genetic engineering. Yes, we’re talking killer sheep. Anything with teeth and a killer appetite can be horrific, even baby lambs. It’s off-beat, way off-color and covered in gobs of blood, with the occasional environmental message. You’ve just got to love those New Zealanders and the special effects wizards of the WETA workshop. Learning a new application? One of my library colleagues recently showed me CustomGuide. CustomGuide has free reference cards that you can download or print for Adobe, Apple, and Microsoft applications. For example, they have cards for PowerPoint 1997 through 2007. My favorite feature is the keystroke shortcuts. You are currently browsing the Library Lagniappe blog archives for the year 2009.